You can usher traditional style into your home with this handsome recliner. 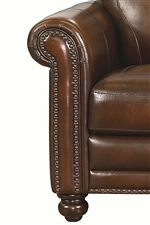 The piece carries a hand-rubbed leather that delivers an old-world flair while the turned legs come in a Heirloom finish. The padded seat is seamed in a picture-frame style while the nailhead trimming comes on an antique brass. Plus, the reclining mechanism adds ideal relaxation. Create a classic look in your home decor with this stunning recliner. 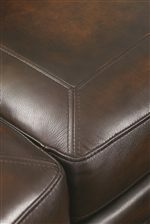 The Hamilton High Recliner with Nail Head Trimming by Bassett at AHFA in the area. Product availability may vary. Contact us for the most current availability on this product.